Each garden on the grounds of Parliament Hill in Ottawa city in Ontario, Canada comes to life in different shades as the flowers starting their blossoming in early spring. The tulip is one of the first flowers to be seen flourishing atop Parliament Hill, followed by daffodils, crocuses and many other assortments of plants. 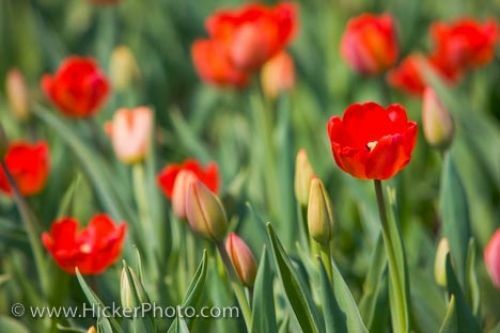 As the sun shines down upon the garden, each tulip works its way through the blossoming process, some being a few steps ahead already flowering, while others remain in bud form a while longer. People wander the grounds of Parliament Hill just to see the beauty of the tulip garden opening and closing every day during spring. Picture of vibrant red tulips blossoming in the garden on Parliament Hill in Ottawa City in Ontario, Canada.